There was one other thing that we knew when we bought the farm. Eventually, we wanted to grow our own food. We’re talking ALL of it, not just the garden stuff. So, we closed on the farm in August of 2000. In September of 2000 we purchased the goats, ordered our first batch of baby chicks, and went to the local auction (its only about ¼ mile from our house so that was easy to find) and bought our first pig. The little female pig came through on its’ own. It looked small and scared and we got her for fifteen dollars – what a bargain (we thought)! Well she turned out to be the runt of a litter that was why she so cheap, no one wants the runts. We tried to feed her any/everything that we could, but she did not want to eat. We finally shared our dilemma with a local farmer, and he stated that pigs need others to eat with. They are a very social and emotional critter, prone to bouts of depression just like humans. When they are alone, they can get very scared, depressed and can die of it! So back to the auction we went. We managed to purchase 2 more pigs, this time fixed males (side note – almost all baby male pigs that go through an auction are fixed, better for putting the weight on). They were a bit bigger than our little girl so we were worried about putting them all together. The very first feeding of our little group was amazing. The little gal pushed and shoved her way past the boys to get her fair share without any trouble at all. We were so proud of her! Our local farmer also shared an insider secret, feed pigs (especially babies since their immune systems are weak at this age) something wet and warm with a bit of peroxide in it. Peroxide? We were confused. He went on to tell us that the use of peroxide helps to keep their lungs clear, which is a common problem in little pigs. One that can kill them! So, following his advice, we purchased a 50-pound bag of whole oats (yes – oatmeal in bulk) and began our daily routine of warm oatmeal (with a touch of peroxide) for the pigs. The funny thing about “warm feed” for a critter is that most every other critter will also want some. It was probably a good thing that it went to the pigs because they don’t share! This is, unfortunately, also how we found out that they are omnivores – they will (and did) eat just about anything. We lost some other animals due to their “hunger pains”, something we were not please about or prepared for. Now we know better – keep pigs of any size away from other animals, especially during births. We continued to give them a warm breakfast every morning even as they grew to full size. A funny thing happened along the way to maturity, my sister decided to name them. Now every farmer knows that you don’t name anything that you intend to eat. We even knew that from childhood – but that didn’t stop her. All three pigs were red in color, and so came the names of Penny and Copper, the only other logical choice to her was from the story of the 3 little pigs – she came up with Styx (like the house of sticks, just a fun way of spelling it). As the pigs grew, breakfast anticipation became a fun game. My sister would go out and call just one – Penny. “Here Penny, Penny, Penny!” she would yell. That little pig would come running, full throttle, to her voice. Yes, it helped that she knew she would be fed, but more important was the amazing thing that Darcy noticed one morning. Penny was talking back to her! First it just seemed like normal pigs grunting during the feeding. But as the days passed, she/we noticed that Penny grunted back to her even when there was no food. Over time she would yell for Penny and call her “my racin hog” and that chubby little monster would come-a-runnin! Darcy also had started scratching the pig, which made her even happier (since pigs can’t reach ¾ of their own body). Now we had a bigger problem. She gave them all names, started talking to them, and one was talking back – these were supposed to be freezer meat! When they grew to about 250 pounds, it was time to make a decision. We both agreed that Copper and Styx would become freezer meat, but what about Penny? I came home from work one afternoon about a week before they were supposed to go to the butcher and discovered the answer to my question. Going through my normal routine – change clothes and do chores, I found the pig’s gate open. I went into a panic! We are right on a highway and next to a major interstate. We are also trotting (pig term for fast movement) distance to the auction. I found Copper and Styx. They were finishing up the grain in the barn – but still no Penny. I scoured all of the barns and sheds, checked the chicken coup because eggs were her 2nd favorite breakfast food, still no Penny. I headed back toward the house to call the locals – police, auction and any neighbors that lived close enough that they may have seen her, when I notice the dog food that we keep on the porch turned over and emptied (I had just filled it with 50 pounds of food a few days earlier). What was into that? Then I realized, Penny must love dog food (not surprising really, since they do eat meat and veggies)! I decided to check the front of the house to see if she decided to go there under the trees. I found her up there all right. We were in the first of our drought years and what little water did fall created a natural stream path through our front yard. Penny, being as smart as she was, discovered that one area between several trees was damp, cool, shaded and best of all, perfect for her nose to dig into. She dug up a hole big enough to fit her whole body, and then some, into it. 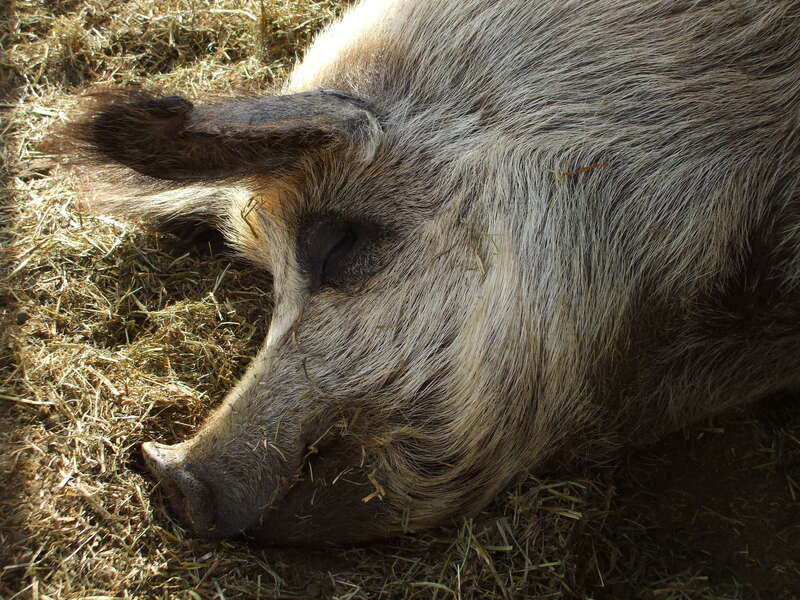 A full belly of dog food, cool mud to lie in, and trees to shade her – what more could a pig ask for. I began to laugh quietly as I didn’t want to wake her. That was the moment Penny the pig went from being freezer meat, to being Darcy’s favorite pet! She loved her dog Bubba, but Penny had her heart!